Frances releases a fisher from a live-trap on the Cooking Lake Moraine. The landowners and volunteers of the Moraine Mesocarnivore Project have been crucial in the implementation, daily research, and success of this project. We have now published the fourth report to Landowners and Volunteers, with updates on our research findings over the last 1.5 years. Please feel free to contact us if you have any questions, comments, or concerns regarding this report. We always look forward to hearing from you. ​We are very grateful of the diverse support for this research - it has been an Albertan Heartland community initiative of the truest sense. How many fisher do YOU think are on the Cooking Lake Moraine? Knowing species density estimates (# of animals/unit area) is an important metric for wildlife management, but one that can be costly and hard to get accurate. We are excited to announce our leading-edge research collaboration with Dr. Joanna Burgar, where we use fisher data from the Moraine Mesocarnivore Project to estimate density from camera traps, as well as hair snags, and quantify the differences in price and accuracy between these two methods. As with all of our publications, the research is strongly supported by local landowners, NGOs, parks, and volunteers. Thank you!! This work has been thanks to the strong collaboration of the Cooking Lake Moraine's local landowners, Parks members and staff, Volunteers, local governments, academics, and NGOs. Thank you greatly for your contributions to this research. The drawings in this publication are thanks to Jeff Dixon. Frances presents a summary of her PhD research to the University of Victoria's School of Environmental Studies Seminar Series, featuring the research conducted to date on the Moraine Mesocarnivore Project. Click here for the Twitter thread that summarizes this talk. Three tests of wildlife management for rapidly changing landscapes: reintroduction, protected areas, and connectivity conservation. Thank you to the 100s of landowners, volunteers, biologists, trappers, Parks staff, County staff, NGOs,and everyone else for their support on this research. It would not have been don with out you! A short write up on this work is now available at BioScience. Stewart, F.E.C., J.P. Volpe, J.S. Taylor, J. Bowman, P. Thomas, M. Pybus, and J.T. Fisher. 2017. Distinguishing reintroduction from recolonization with genetic testing. Biological Conservation 214:242-249. We want to thank the many landowners, eNGOs, friends, trappers, and Parks members for being involved in this work with broad conservation implications. Top notch research does not come together without collaboration! Thank you. The Nature Conservancy of Canada has been a fantastic collaboration and support throughout the Moraine Mesocarnivore Project. They have recently featured this project as their Story From the Field - you can read it here. Public involvement has been a crucial component of the Moraine Mesocarnivore Project - and as such we feel it our responsibility to deliver the results of this project to all of those involved. 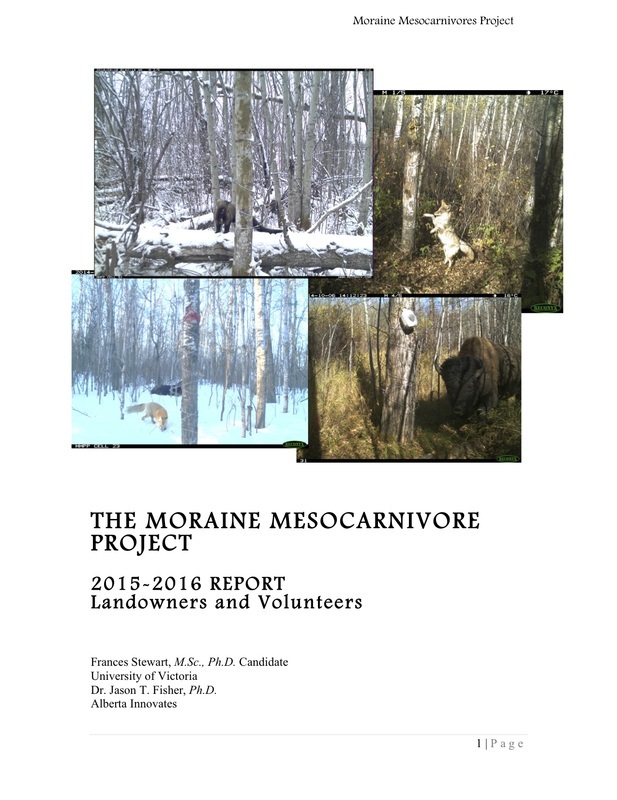 ​The third yearly Moraine Mesocarnivore Project Landowner and Volunteer report is now available here. It includes preliminary results, future plans, and our appreciation for the support and enthusiasm from everyone who has been involved on this project to date. Guess what time of year it is? Fisher kit time! 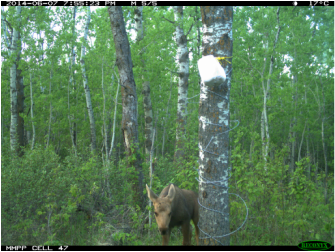 R. Melnichuk has been kind enough to share some photos obtained from a wildlife camera in central Alberta last June. This kit is about 3 or 4 months old, here with its mom. Mother fishers give birth at this time of year (late March to early April) to 1-3 kits. The kits are born blind, and can take up to 8 weeks until they weaned and mobile enough to leave the den on their own. That is when the learning really begins! Fisher kits explore their surrounding with their mother until the fall, and then set off to set up territories of their own. 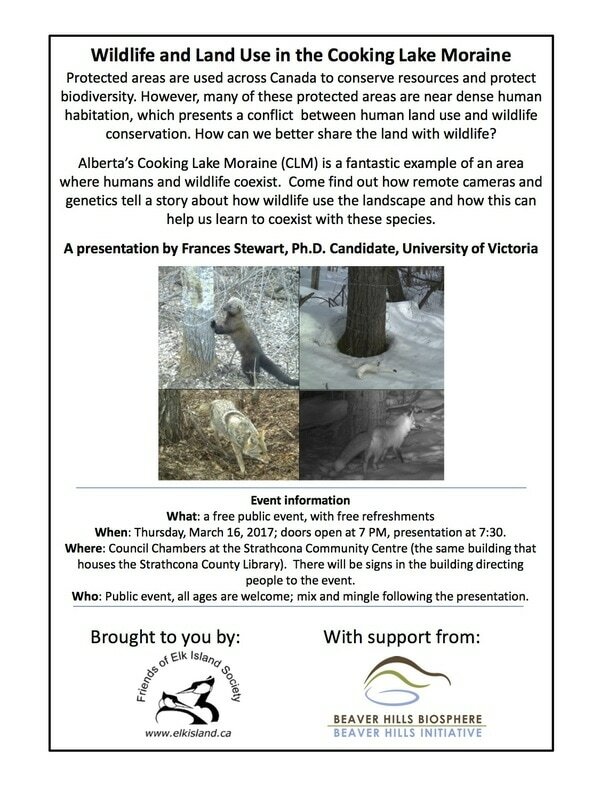 The Friends of Elk Island Society and The Beaver Hills Initiative have been kind enough to organize a public presentation on the Moraine Mesocarnivore Project. Please join Frances as she provides an update on the project as well as some results to date. 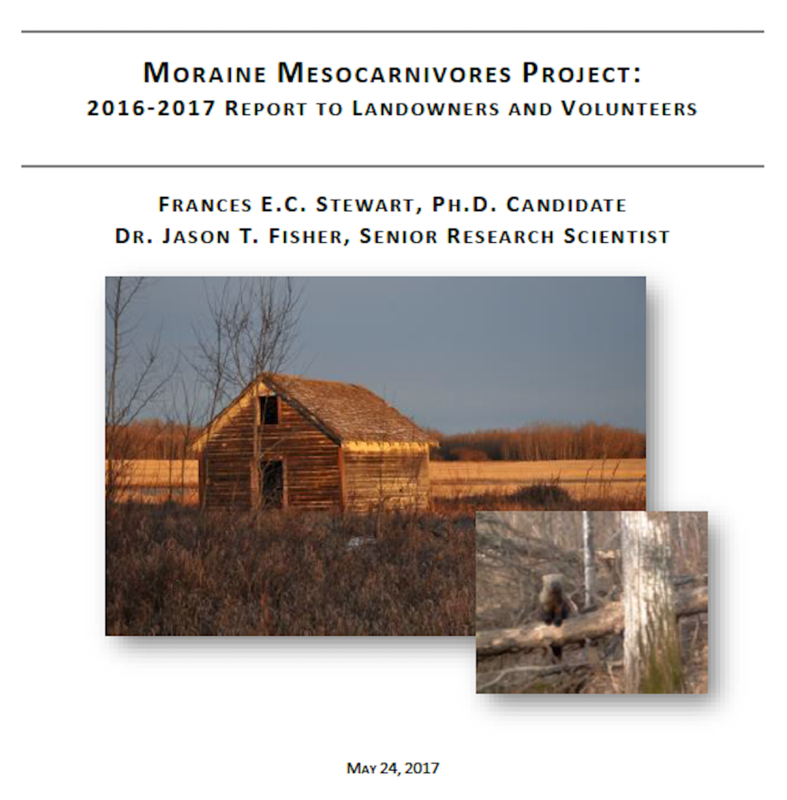 The second Moraine Mesocarnivore Project field report to Landowners and Volunteers is now available here. Check out what we have discovered over the last year, and what is going to be coming down the tube! We are very appreciative of all the local help and support this project has received - in all of the different forms. We'd like to specifically thank The Friends of Elk Island Society, Miquelon, Blackfoot, and Elk Island staff, The Beaver Hills Initiative, The Strathcona Wilderness Centre, I. Brusselers, B. Eaton, T. Zembal, A. McAdie, V. Hansen, all Landowners, Volunteers, and Augustana CSL students, and of course our funders. The next steps of this project are data organization, analysis, and presentation. Keep your eyes posted here for upcoming public and academic presentations, scientific articles, and press releases. We have completed field work for the 2015/2016 season and look forward to seeing what patterns are revealed by the data we've collected so far. This will be Frances' main job as the PhD student over the next ~2 years. We are very thankful for many people's support and help on this project, with special thanks to the Friends of Elk Island, the Beaver Hills Initiative, Alberta Parks including Miquelon and Blackfoot staff, Alberta Innovates-Technology Futures, Parks Canada and Elk Island National Park, and many landowners from the Cooking Lake Moraine. Keep your eyes posted here for an updated Landowners Report, upcoming public talks, press releases, and publications associated with the Moraine Mesocarnivore Project. Congratulations to the Beaver Hills Initiative on the successful nomination of the Cooking Lake Moraine/Beaver Hills Area as a UNESCO Biosphere Reserve! It is one fascinating area to study. Data are starting to roll in as we have initiated a successful 2015/2016 field season over the last two months. 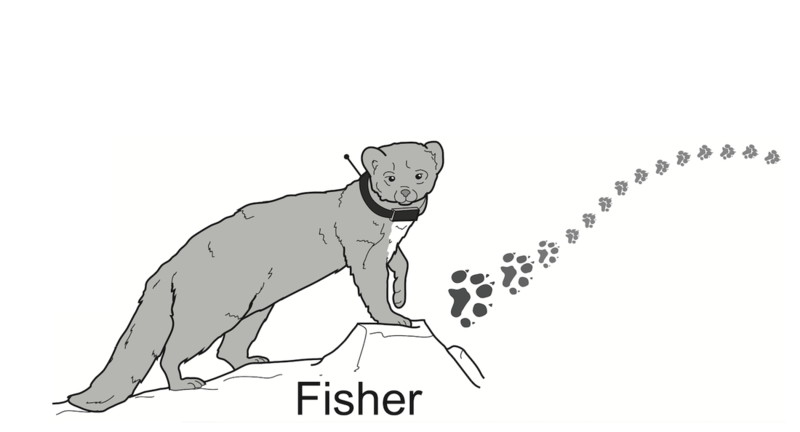 With both camera traps collecting pictures to quantify mammalian biodiversity, and fisher running around with GPS collars on them, we are looking forward to discovering how mammals are using the meshwork habitats of the Cooking Lake Moraine! January 22nd: Frances will be giving an evening public talk, courtesy of the Friends of Elk Island Society. 6:30pm, 50 Spruce Avenue, Sherwood Park AB. 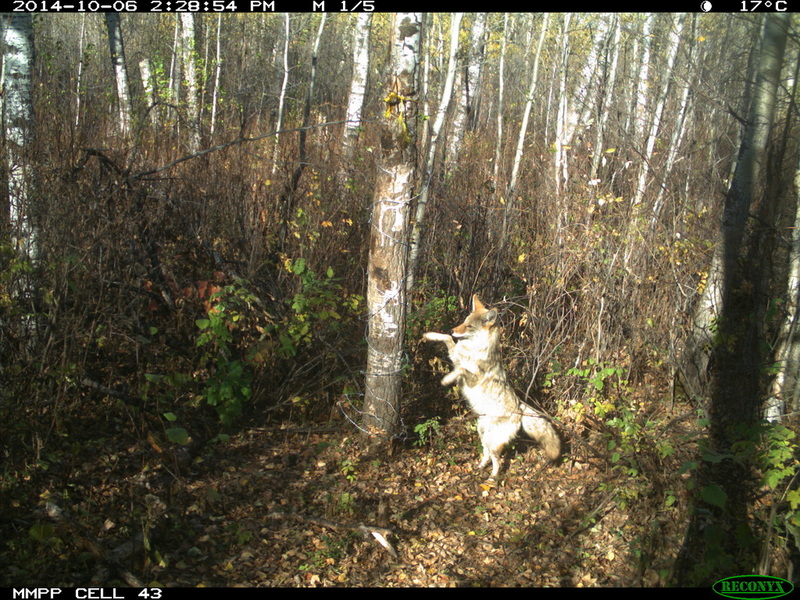 We are jumping for joy at the start of our next field season - and so is this coyote!! We'll be out collecting more data as part two of the Moraine Mesocarnivore Project from November 2015 to April 2016. Keep your eyes on this website, @StewartResearch or @JasonTFisherLab for regular updates! The Moraine Mesocarnivore Project is looking for one motivated research assistant to aid Frances Stewart with data collection this winter and spring 2016. Please see the document posted to the left for details. Applications are due September 27th, 2015. HOT OFF THE PRESS! 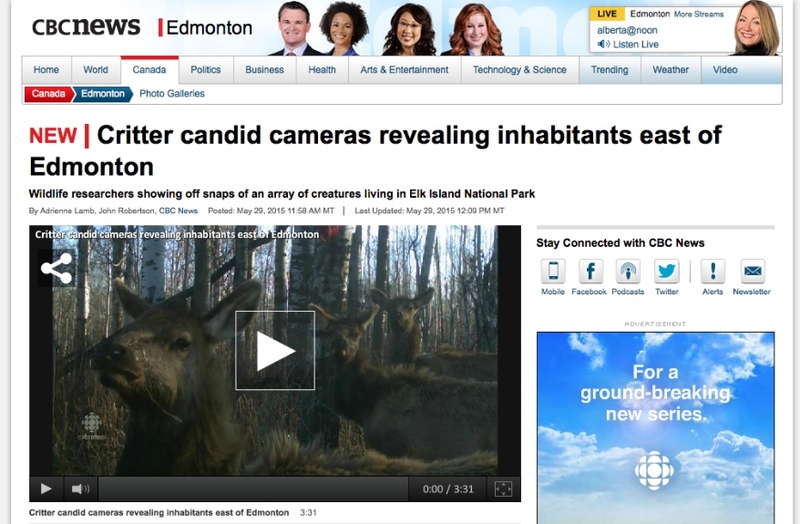 Thanks to the Friends of Elk Island Society's hard work as volunteers on the Moraine Mesocarnivore Project, our work is being featured on the next CBC's Our Edmonton Program. 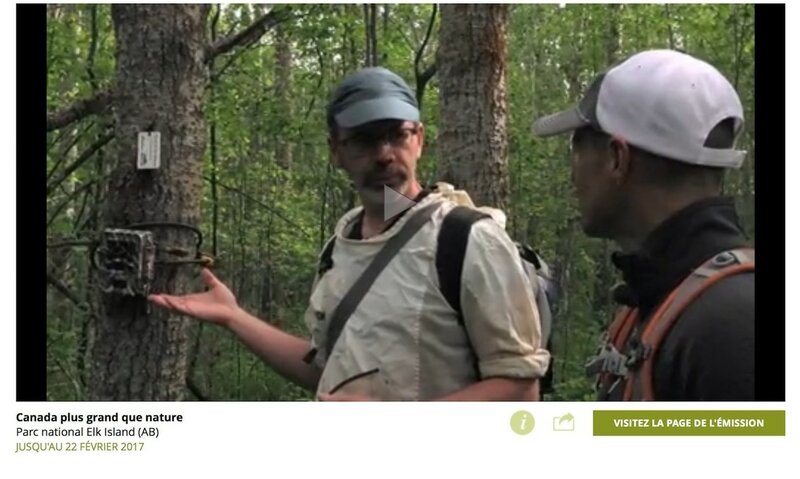 It features the call for a Biosphere Reserve in the Beaver Hills and airs on May 30th at 10am, May 31st at 11am and June 1st at 4pm. Catch the press release here. We've previously received media coverage on black bears in Elk Island National Park, covered at CBC News Edmonton, Sherwood Park News, and The Edmonton Journal. The Moraine Mesocarnivore Project Report for 2014/2015 is now available here. 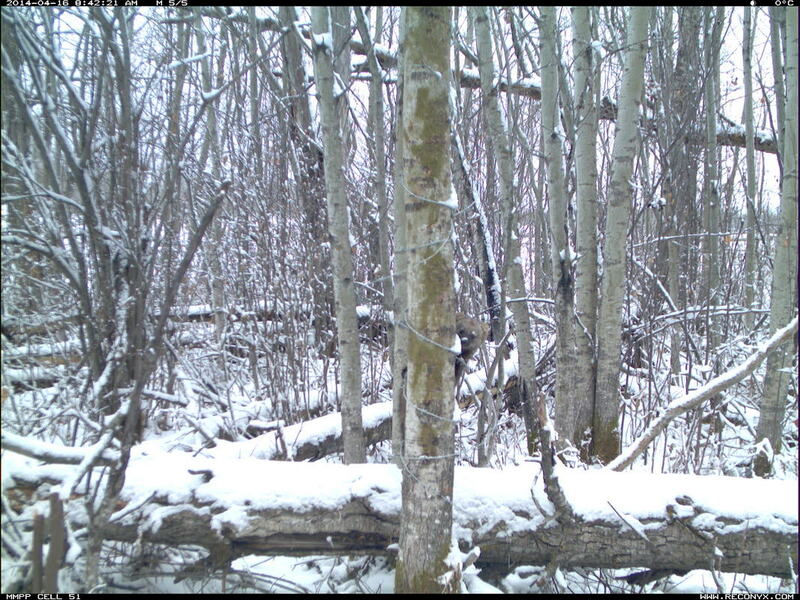 A rare sight of black bears have been captured on our wildlife cameras in Elk Island National Park thanks to the hard work of the Friends of Elk Island National Park. You can read about the press releases on these pictures, and a bit more about our project on the CBC News Edmonton, Sherwood Park News, and The Edmonton Journal. 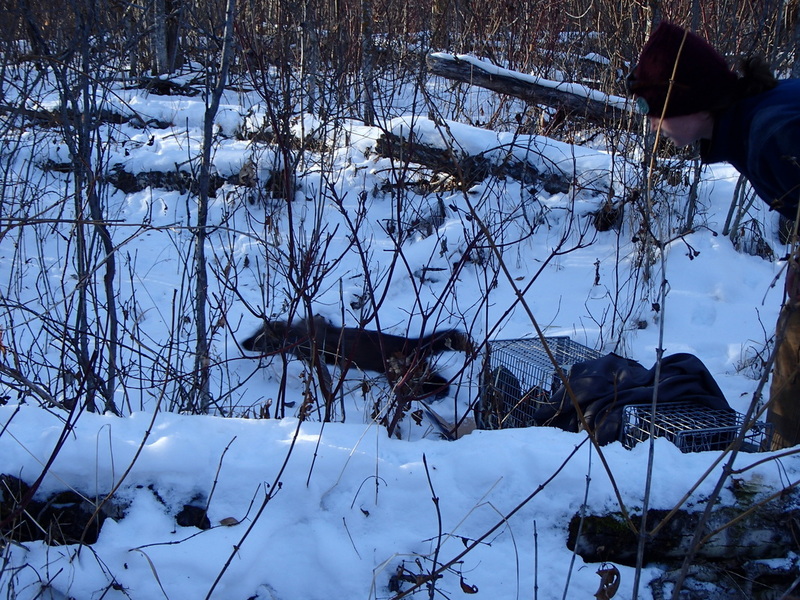 The majority of our mesocarnivore research has wrapped up for 2014, but we are lucky to have the Friends of Elk Island Society continue monitoring several sites within the park. We are looking forward to seeing what species we get photos of over the summer season, and how many of them are mesocarnivores! Our mesocarnivore research has been going well this past spring, and as the fisher are starting to molt their pelts we are obtaining a lot of great hair samples. We are looking forward to identifying individuals using the DNA collected in these samples - this way we will be able to tell how many fisher inhabit the Cooking Lake Moraine. The Moraine Mesocarnivore Project is officially up and running and we are excited to see what wildlife species we obtain pictures of throughout the Cooking Lake Moraine - a really interesting and unique mix of different landscape such as a national Park, Two provincial parks, a bird Sanctuary, conserved lands, all connected by privately owned forest "stepping stones".